We’re pleased to report that we have just published another new Monumental Inscriptions volume on CD, this time for the parishes of Lyne & Megget and of Manor in Peeblesshire, Scotland. Lyne & Megget is the smallest of the Peeblesshire parishes and the Megget part was part of the parish of Traquair prior to the Reformation. Lyne churchyard is small with only 32 stones remaining but this includes one of the few 'Adam and Eve' symbolic stones in the Borders and which is in excellent condition. There are no known burial grounds in the Megget valley but many of the inhabitants used St Mary’s of the Lowes kirkyard. The parish of Megget includes the farms and settlements of Henderland, Craigierig, Cramalt, Glengaber, Meggetknows, Shielhope, Syart and Winterhopeburn. A new church for Megget, the 'Tin Kirk' was dedicated in 1905. The books of Dr Clement Bryce Gunn, and the published photographs of T Crozier, shed so much light on the parishes and the events there. Pre-1855 monumental inscriptions in both Lyne and Manor churchyards were recorded by Sheila A Scott in 1971, along with the other churchyards in Peeblesshire. 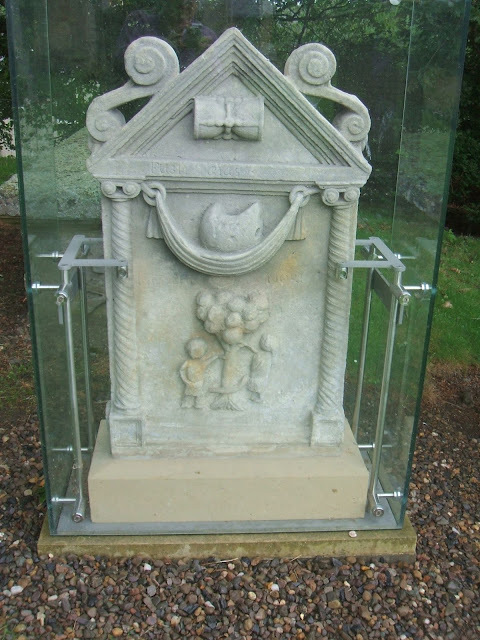 We are indebted to her work, to the foresight of Mr J H Hendrie who initiated the project and to the Scottish Genealogy Society who have kindly allowed us to use her transcriptions where some of the stones have become unreadable or have not been identifiable in this survey. Usually, we include Hearth Tax or Poll Tax records from the 1690s but for Peeblesshire, the only records held at the National Records of Scotland summarise payments collected by place and do not include the usual list of names and individual payments. the minutes, correspondence, accounts and other papers and the returns and militia lists drawn up by the parish schoolmasters. The transcriptions of some of these militia lists are included together with some unique correspondence which has survived. School admission registers for all three schools are available and are transcribed here. In all, 699 admissions are listed from 1873 to 1919. This volume on CD comprises a map of Peeblesshire, introduction, history of the parishes, lists of ministers of Lyne, Megget and Manor, Lyne & Megget Proclamations 1727-1730, Lieutenancy Records, plans of Lyne and Manor Churchyards, Lyne monumental inscriptions (gravestone inscriptions), photographs of all the visible gravestones, War Memorials, Rolls of Honour, school admission registers for Lyne Public School, Manor School, Megget School, indexes of surnames in Lieutenancy Records, monumental inscriptions and school admission registers. The school admission registers show the date admitted, child's name, parent's name, address, date of birth, previous school, leaving date. There are 211 different surnames included in the inscriptions on the gravestones, and they are: Affleck, Ainslie, Aitken, Aldous, Alexander, Allan, Alston, Anderson, Ashford, Baillie, Ballantine, Ballantyne, Balmbra, Barr, Barrie, Bayne, Beattie, Bell, Bertram, Black, Blackie, Blacklaw, Blake, Bolton, Brockie, Brodie, Brown, Browning, Bruce, Brunton, Bryden, Brydon, Burnett, Cairns, Calderwood, Campbell, Chambers, Chancellor, Clark, Clelland, Cochrane, Coltherd, Coltman, Corrie, Cranston, Cruickshank, Currie, Dalgleish, Dalgliesh, Davidson, Day, Deans, Denholm, Dickson, Docherty, Dodds, Edward, Elder, Elliot, Fergusson, Findlay, Finlayson, Finnie, Fisher, Fleming, Forrest, Forrester, Forsyth, Forsythe, Fotheringham, Fraser, Freer, French, Frier, Gall, Geddes, Gilchrist, Glendinning, Gossar, Gowans, Graham, Gray, Grieve, Haldane, Hall, Hamilton, Handyside, Harper, Hart, Hatton, Hay, Helm, Henderson, Hewat, Hill, Hislop, Hodge, Hogg, Hoggan, Hooper, Horsburgh, Hunter, Hunter, Hutchison, Inglis, Irvine, Jamieson, Jeffrey, Johnston, Jordan, Kennedy, Ker, Kerr, Ketchen, Kinnon, Laidlaw, Lamb, Laurie, Law, Lawson, Lee, Linton, Little, Lothian, Mackenzie, Macpherson, Macrae, Macvicar, Marshall, Martin, Mathieson, Mccallum, Mcculloch, Mcintosh, Mclaren, Mclean, Melrose, Mitchell, Mitchelson, Moffat, Moir, Morrison, Morrow, Munro, Murdoch, Murray, Naesmith, Nisbet, Orr, Paterson, Paxton, Penney, Pettigrew, Pirgivie, Porteous, Portious, Proudfoot, Purves, Rae, Read, Reid, Richardson, Ritchie, Robb, Robertson, Ross, Rutherford, Salton, Scarth, Sclater, Scott, Smellie, Smith, Somerville, Stevenson, Stewart, Stuart, Swan, Swinton, Taggart, Tait, Taylor, Telfer, Tennant, Thomson, Tod, Todd, Trinder, Turner, Tweedie, Usher, Utterson, Vair, Veitch, Waddell, Wales, Walkinshaw, Watson, Weir, Weston, White, Whitson, Wightman, Wilday, Wilkie, Wilson, Wood, Wood-Gush, Wotherspoon, Young, Yule. The CD costs £7 plus postage. You can get a copy at our archive at 52 Overhaugh St, Galashiels, TD1 1DP, alternatively, please use the Buy now button below. If there are other publications you want to buy at the same time, please contact our Sales Team on our Contacts page using the contact type Order for Publications. During recent correspondence with one of our Australian members it occurred to me that many people might not know in which one of the 4 Scottish Borders counties (Berwickshire, Peeblesshire, Roxburghshire and Selkirkshire), the parish in which they're interested, lies. 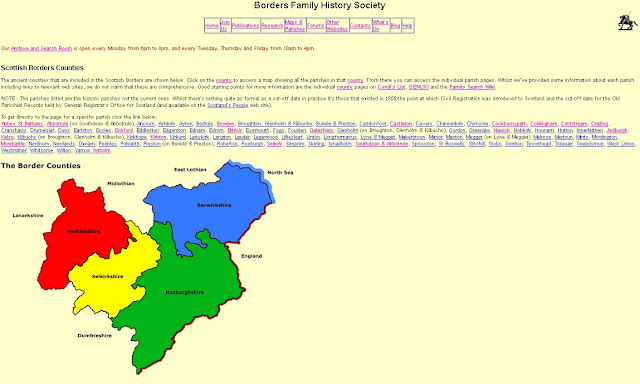 So I've added a list of the parishes to the Maps and Parishes page where each named parish is a direct link to the parish page. There is a downside to this and it's that the map of the Scottish Borders counties not be visible, depending on your browser settings. So, in the first paragraph, each occurrence of county is a link taking you to the top of the map. I hope this enhancement helps you.